Gardeners usually don’t like moles very much because they dig holes and tunnels in the yard, but you have to admit, moles are kind of cute! These little animals are about the size of a chipmunk. They’re usually brownish gray to black and they live in North America, Europe, Asia and even parts of Africa. There are no moles in Ireland. Moles look a little like mice or squirrels, but more all about moles is that they’re not rodents.These little animals are about the size of a chipmunk. Moles look a little like mice or squirrels, but they’re not rodents. They are digging animals that love to eat bugs. Their favorite food is worms. One mole can eat over 50 pounds of worms in one year. 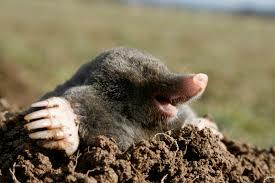 Moles also eat ants, spiders and grubs. 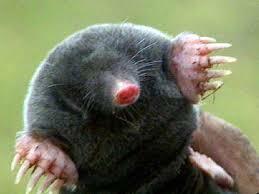 Moles have curved front paws and claws that dig like shovels. They build long tunnels and underground homes. Moles can dig up to 18 feet in one hour. Moles have a good sense of smell, but they don’t see very well. In fact, their eyes are hard to find because they’re very small and covered in fur. Moles don’t hibernate. They work all year round to catch food. These little animals paralyze worms and insects with poison in their saliva. Then they store the insects in an underground room to eat later. Their favorite food is worms. 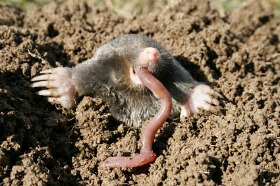 One mole can eat over 50 pounds of worms in one year. A video documentary about the star nosed mole, explanations about its bodily functions for feeding. Question: How do moles breathe underground? Answer: Moles have twice as much blood as other mammals and they have more oxygen in their blood, which helps them live underground. Question: How many babies do moles have? Answer: Moles usually have litters with 2 to 6 babies. The babies can take care of themselves when they are only one month old. Enjoyed the Easy Science for Kids Website all about Moles info? Take the FREE & fun all about Moles quiz and download FREE Moles worksheet for kids. For lengthy info click here. Declan, Tobin. " Fun Mole Facts for Kids ." Easy Science for Kids, Apr 2019. Web. 26 Apr 2019. < https://easyscienceforkids.com/all-about-moles/ >.